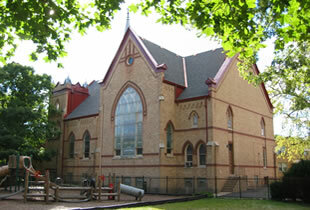 St. Paul Lutheran Church | Hutchinson Design Group, Ltd. 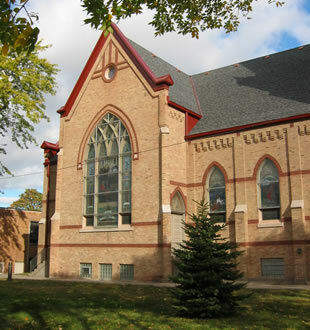 This historical church located in downtown Skokie is getting ready to celebrate its’ 125 year anniversary and was in need of a new roof system to stem the tide of moisture intrusion. This multifaceted project entailed the removal of 124 years of shingle overlays and the installation of new plywood roof decking and a new 50 year asphalt shingle roof system. New prefinished metal gutters and flashings were installed. The original existing ornate metal cornice and steeple work was repaired, primed and painted. On the low slope roof areas the deteriorated masonry was repointed and the existing deteriorating PVC roof was removed and replaced with a fully adhered EPDM roof systemincorporating tapered insulation to promote positive drainage and eliminate ponding. Prefinished metal siding was installed over the interior face of the masonry parapets, the security lighting and conduit was remounted in a way not to effect the new roofing. steel and 16 oz copper.